If you use Zoho Books, Zoho Invoice, Zoho Subscriptions, or Zoho Inventory, you can get started right away. It takes just five minutes to start accepting payments from your customers. 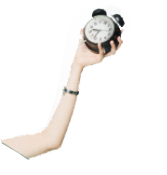 You don’t have to worry about filling out long forms or waiting for days to have your merchant account activated. More importantly, as a benefit of this partnership, you can enjoy some of the lowest transaction fees in the industry. If your business is registered in the USA, just enter your business details and bank information, and you’re ready to go. Once your account is ready, you can immediately charge your customer’s Visa, Mastercard, or Amex cards. 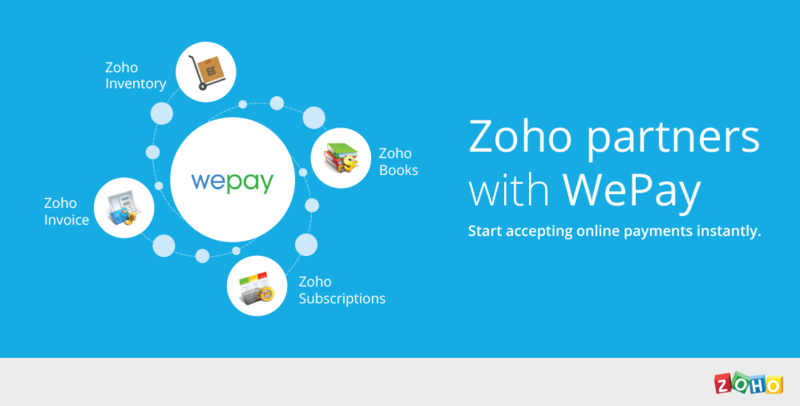 With Zoho, there are no setup or monthly fees involved! You will only be charged a flat rate of 2.75%+30 cents per transaction for all card payments including Amex. We will be your main point of contact. 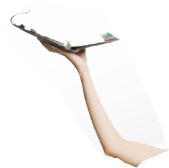 Any questions on invoicing, chargeback, refunds, discounts – you reach out to us. We will not redirect you to a different payment service. You can email us at support[at]zohofinance[dot]com and our wonderful support team will help you out with all your questions and concerns. The amount your customers pay you will be put in your merchant account, which will be processed daily for settlement. After the payment is processed, it will get deposited in your bank account in 2-5 working days. 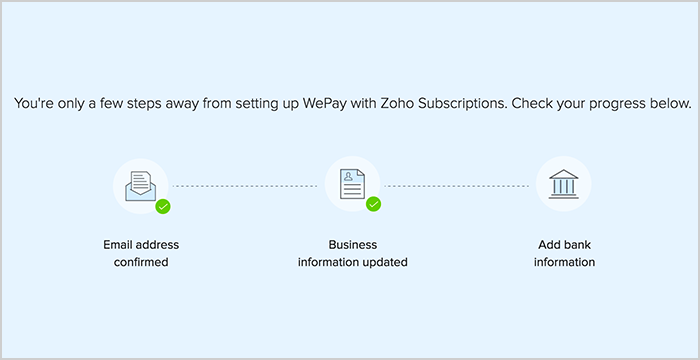 You can track customer payments, transaction fees, and refunds, as well as chargebacks separately in a clearing account in Zoho Books. If you set up Rules, accounting for these transactions will be, well .. automatic. Login to your Zoho service and head to the ‘Integrations’ section in Settings. 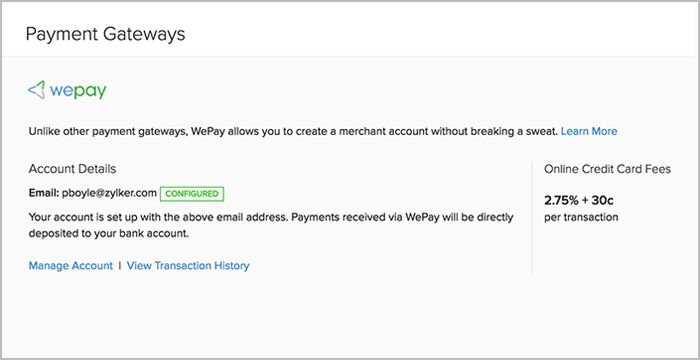 You’ll find WePay listed among the other Online Payment Gateways . 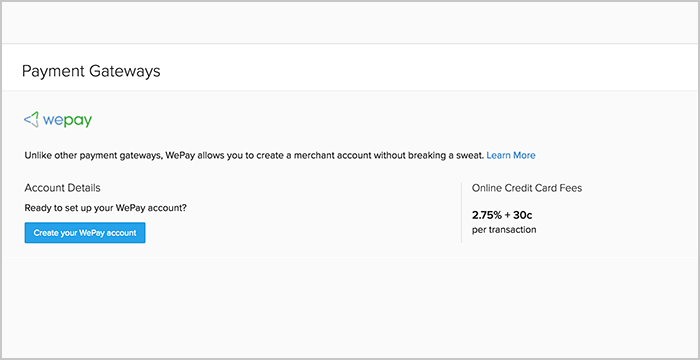 Click on ‘Create your WePay account‘ to kickstart the process. We’ve added a nifty status tracker on your Dashboard, so you can always check the status of your setup. Once the status changes to ‘Configured’ (as shown below), you will start receiving money directly in your bank account. If you’re eager to get started, go ahead and read more about the integration in the respective product’s help document – Zoho Books, Zoho Invoice, Zoho Subscriptions and Zoho Inventory. We’ve put in quite a bit of effort to make the entire process seamless for you. Give it a whirl and let us know what you think.